We move and we shake. We've gone to great lengths to connect with elite organizations and trade associations. We've been nominated for awards, competed in contests and earned certifications. Below is a snapshot of the fruits of our labor. If you have questions about specific awards, certifications or affiliations that are not listed here, please ask us! Many technical certifications held by our individual team members are omitted from this list, and we are always happy to provide additional information. 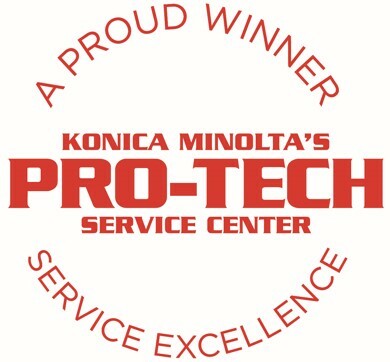 Konica Minolta presented Meridian with their prestigious Pro-Tech Award for Service Excellence for four consecutive years — 2017, 2016, 2015 and 2014. As of 2017, Meridian is the only service provider in the greater Washington, DC metro area to receive the Pro-Tech certification more than three years in a row. Inc. Magazine's acclaimed annual list of America's fastest-growing private companies, the Inc. 5000, named Meridian as one of their 5,000 dynamic businesses in 2015 and again in 2016. These were the sixth and seventh times Meridian was named an Inc. 5000 Honoree since 2007 — officially securing our spot on the Inc. 5000 Honor Roll! Our solutions specialists have Certified Document Imaging Architect (CDIA+) certifications. This certification is an international, vendor-neutral program that tests expertise in the technologies and best practices used to plan, design, and specify a document imaging management system. 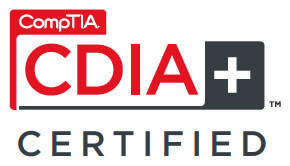 The industry recognizes the CDIA+ certification as a consistent, objective way to evaluate imaging industry professionals. Geared toward projects with quantifiable business outcomes, our Black Belt Certified Professionals leverage the Six Sigma methodology to improve business processes through statistical analysis of data, rather than guesswork or the implementation of standardized one-size-fits-all solutions. The Six Sigma methodology is defined by 5 DMAIC steps: Define, Measure, Analyze, Improve and Control. Meridian is an active member and Gold Sponsor of the Capital Chapter of the International Facility Management Association (IFMA). IFMA spots trends, conducts research, provides educational programs, and assists corporate and organizational facility managers in developing strategies to manage human, facility and real estate resources. In addition to company sponsorship, some Meridian team members also participate individually in IFMA activities and committees, such as the Membership Committee, holiday party and other networking events. We are a member of the Business Technology Association (BTA), an international trade association of office technology dealers, value-added resellers and manufacturers, distributors, wholesalers, service companies and publishers. Also a member of the Business Products Council (BPCA), Meridian belongs to an exclusive peer group of office equipment and document solutions dealers dedicated to enhancing the industry. Through the exchange of ideas, benchmarking, knowledge and business strategies, BPCA members foster an innovative approach to business technologies. Most trade associations have a presence in the DC area so that they can advocate to policy-makers in the interests of their mission and members. So, as an engaged partner with many trade associations and non-profit organizations, we're active with the American Society of Association Executives (ASAE), including attending and exhibiting at the annual ASAE Tech Expo and Conference. The Microsoft Certified Systems Engineer (MCSE) certification validates proven experience and knowledge in using Microsoft products and solutions and demonstrates advanced skills in designing, installing, configuring, and troubleshooting network systems. Meridian has been repeatedly recognized — more than six times — as an "Elite Dealer" by both Office Dealer Magazine and The Week In Imaging. The Elite Dealer programs are the publications' annual salutes to the industry's best and brightest office product dealerships. Meridian founder Terri Sullivan was named a Smart100 CEO by Washington's SmartCEO magazine for two consecutive years. We've been named as one of the 100 Best-Run Companies in the Washington, DC area by SmartCEO magazine. This prestigious accolade honors 100 companies that are leaders within their industries and have experienced consistent growth. SmartCEO magazine has also named Meridian Imaging Solutions as one of its Future 50 winners multiple times. The Future 50 Awards program recognizes 50 of the Greater DC metro area's fastest growing mid-sized companies, who represent the future of the region’s economy and embody the entrepreneurial spirit critical for leadership and success. Meridian has been designated as a Five-Star Solutions Certified dealer, demonstrating our ongoing commitment to superior customer service and excellence in solution-based applications. The Washington Business Journal has recognized Meridian on multiple occasions for awards and nominations such as Largest Office Equipment Dealerships, Largest Office Retailers, Fastest Growing Businesses and more. Meridian originated as a small, woman-owned company. Our founder, Terri Sullivan, owned the business for 30 years, until Meridian's recent acquisition by Konica Minolta in March, 2016. While we are excited to move forward as a wholly owned subsidiary of Konica Minolta Business Solutions USA, Inc., Meridian will always support women in business and value the relationships fostered through the organizations/programs below. Meridian was SWaM certified through The Virginia Department of Minority Business Enterprise (DMBE). This certification program is designed to facilitate business between state/local government entities and Small, Women- and Minority-owned organizations. Our SWaM certification is valid through October 2, 2018. Learn about our technology partners here.